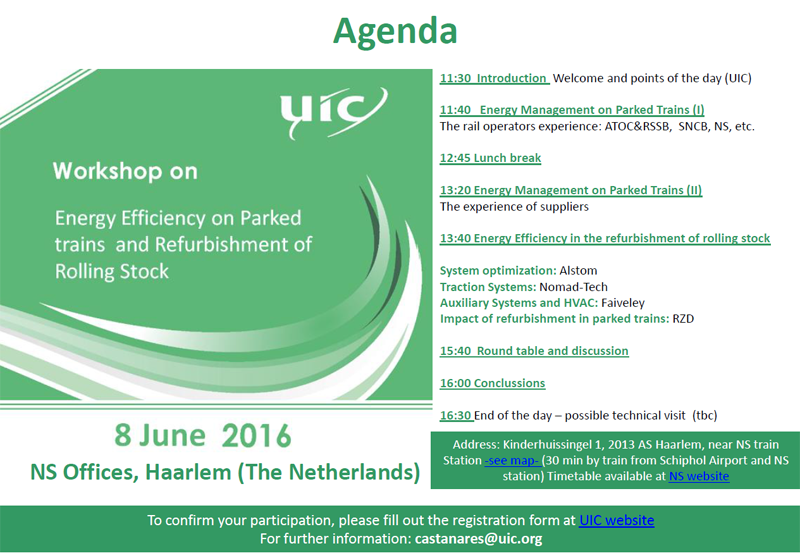 A UIC workshop dedicated to Energy Efficiency of Parked Trains and Refurbishment of Rolling Stock will be held on 8 June at the NS offices in Haarlem, the Netherlands. This workshop will be an excellent opportunity for managers, advisors and experts to exchange experiences on best practices, procedures and technologies on the management of parked trains regarding energy efficiency and the refurbishment of rail rolling stock. Representatives from the supply industry and managers of rail companies involved in energy efficiency programmes dedicated to this topic will take part in the workshop. The workshop will be an excellent opportunity for railway companies to meet and exchange best practices on all related aspects during the dedicated technical session. Technical presentations on the performance and management of energy efficiency of parked trains and refurbishment of rolling stock will be followed by fruitful discussions allowing benchmarking as well as sharing best practices and possible challenges. The programme will include a technical visit to railway facilities. We look forward to seeing you in Haarlem (Netherlands) on 8 June.